Max Kozloff on Pieter Bruegel and his P.O.V. Though Pieter Bruegel illustrated folksy proverbs with affection, as part of his culture, he did not treat them as truths to be advocated. In fact, the wisdom of his art goes beyond them and is pertinent even to issues today. With shrewd perception, he reflected upon the discordant realities of the time, close up, or from a wide perspective. Whether they were Protestants or Catholics, Flemings in the late 1550s –1560s had to live in an occupied territory, ruled from afar by the Spanish king Phillip the Second, whose Inquisition imposed its religious dogma and a police state upon the citizens. Under such oppressive conditions, when Bruegel envisioned scriptural texts, he appears to have acted more like an independent thinker, with some levity, than a true believer. A few of his devotional scenarios, instead of being hushed in sacrament, are rather nattering and marginal or packed in large crowds. It was as if the soloists were swallowed up by the chorus. Like many colleagues, he updated liturgical story lines by populating them with depictions of Flemish town and country people, treated as proxies for Judeans of old. If he imagined them as present at biblical enormities, he emphasized that it was mostly out of happenstance, not witness. Involved with their own motley affairs, they take up irrelevant space in what is presumed to be a didactic message. When he depicted farmers at work, however, he respected them for their service to the continuity of human life on earth, within the benevolence of nature. 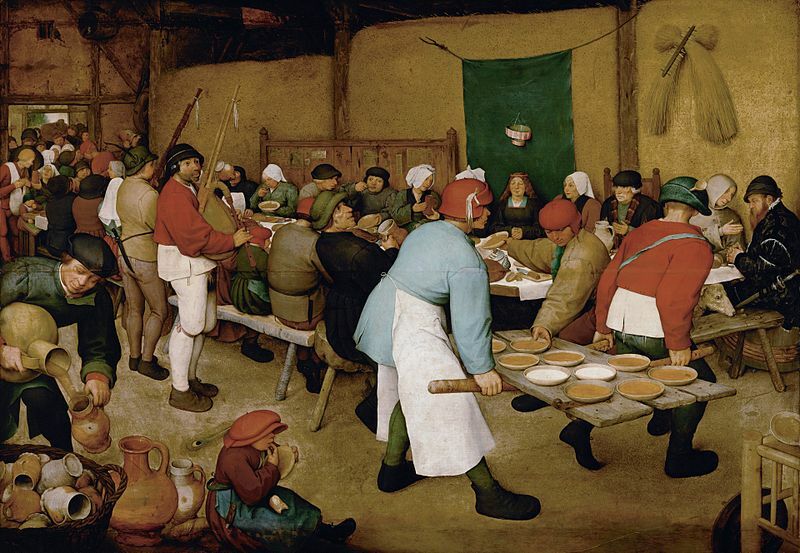 Bruegel was not the first, but he was the most insistent artist to give such an attentive—and often frank—characterization to those of rustic birth and lowly means. Elsewhere in his work, he sees the dark side of the era: hills are surmounted by gallows, incendiary fires flicker in the night sky, and lances bristle among rocky heights. With zeal, the painter shows the nightmare of violence in cultural or historical legend, if not local action. (Although even here, he lends sparkle to his art by inclusion of the red tunics worn by sinister imperial gendarmes, ersatz Roman legionnaires, mounted on their well-groomed horses.) Whenever I consider his work, I am struck by his intrepid mismatching of contentious themes. The ancient past and his daily present are locked in an iconography of contradictions whose anachronism was probably intended. And then there is his employment of vantage that makes them particularly vivid—his P.O.V. The phrase “point of view” generally refers to a person’s attitude, as it directs a statement, or more specifically to his or her viewing angle vis-a-vis something seen. Either way, one is made conscious of a mode of address that stands out, relative to others, and that may be modified, replaced, or dropped, as circumstance influences it. If I acknowledge an utterance as coming from a certain point of view, I mean to distinguish it from a doctrine that requires strict adherence. In the practice of European painting, up to the Renaissance, church doctrine was most visibly upheld by painters in the rhetorical treatment of stories from the Gospels, imaged within a fixed, constant, shallow otherworldliness of space. Ask yourself where the saintly figures were located, and you must answer: in a no-place, a magical zone made accessible to the viewer by the openness of the frame in question. Predellas from altarpieces, frescoes, and illuminated manuscripts were segmented as conspicuously enclosed figurations within summary backgrounds, maybe appointed with a few props. The story content was usually centered in these imaginary windows and delivered by frontal or silhouetted exposition. Even when supernumeraries were allowed to ruffle the scene, viewers were left in no doubt as to who were, and who were not rated as main protagonists of the earthly or celestial drama. Of course, these art protocols were modified late in the 15th century and profoundly transformed in the 16th—as were many other conditions of that inquisitive age. For the pictorial arts, new systems were developed to apply to the representation of appearances. Single point perspective rationalized the trajectories of urban space along receding diagonals, while atmospheric perspective evoked the distance of terrains through the gradual decrease of color saturation, softened contours and the diminished scale of features. No longer stationed in airless, deferential voids, (like gold leaf), figures could be activated within interiors or enveloped by the panoramas of nature. Those old-time, up-front, static groupings of the blessed were absorbed into a tide of domestic or pastoral scenography, much of it amplified through coherent recessions in space. Cubical rooms and urban stages or plazas did wonders to situate Biblical events. Everything began to seem to viewers more approachable and comfortably positioned. But narrative could be seen to flounder in representations of the outdoors, when characters were inserted into the distracting gorgeousness of nature. Here, pictorial art reckoned with the massive entrance of points of view. They mingled with traditional doctrine, in an early version of what has since come to be known as the blurring of genres. Bruegel’s contribution to this dynamic was singularly invitational—and even now, under-estimated. Often, he greets us with curves that glide and turns that route the eye towards the innards of the spectacle. Such is the left hand, deep slope of the cliff in “Hunters in the Snow.” With a few more steps, it looks as if the hunters might take a calamitous fall. 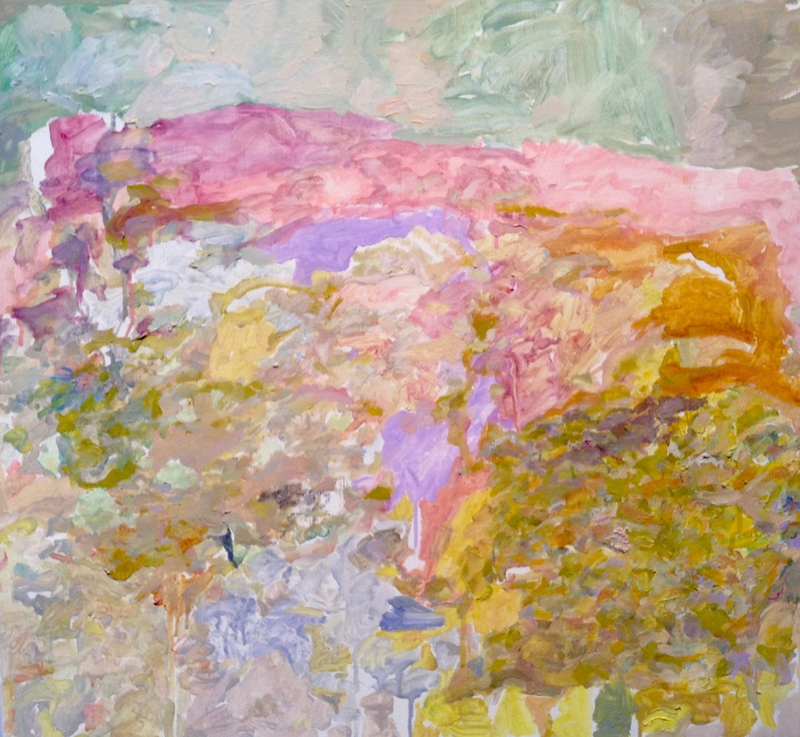 In the mid-zones of other tableaux, zigzags of river or estuary, coursing through mountainous ground, stretch away miles into the light– or dark. For Bruegel’s purposes, these lateral complications were useful in evoking the finality of grand horizons. Just the same, when you look down from them toward the bottom of the picture, i.e. from the distant to the near, you discover what truly fascinates him: the process of seeing from a height. This descending but still levitated gaze would not be as observant as it is without the master’s ambivalence about his own narrative policy. His friend Abraham Ortelius, a distinguished geographer, wrote “In all [Bruegel’s] works there is always something to understand beyond what is depicted.” My own candidate for that “something” is the pull of gravity. That wooden cross in “The Road to Calvary” is too heavy a burden for the poor little man to bear. About the peasants thumping at their dance, or those sleeping it off in “The Land of Cockaigne”, especially the latter, you feel the solidity and weight of their ponderous bodies. Fluttering snowflakes in an “Adoration of the Magi in the Snow” decorate their own downward motion. Elsewhere, the sun’s heat has melted the waxy attachment of Icrarus’s wings, dropping him off with a minor splash into the water. Drowning was the price he paid for his aerial hubris. As for Bruegel’s “Cripples”, with their stumps replacing legs, these men are brutally grounded, and don’t like it, as can be plainly seen. Ground level would also have been an uncomfortable surface for those he portrayed in “The Parable of the Blind.” They would surely have mistrusted their sense of balance and direction, which affected their alignment with the things around, as well as confounded their assurance of where to go. In such a case, any navigation of the world would become treacherous, if not vain. They hesitate, these shabby, stooped derelicts, they stumble, blunder, slip and will go down. For a blind person, to lead this errant procession would be as clueless as to follow it. But this literal reading of the parable, Jesus’s condemnation of foolish Pharisees, is left behind in Bruegel’s heart broken treatment of his subject. Blindness, a disability which must have horrified him as a visual artist, induced him to paint what look to be portraits, open mouthed, with vacant gaze lifted upward. We are not accustomed to seeing a nominal illustration supersede its text on a note of anguish. 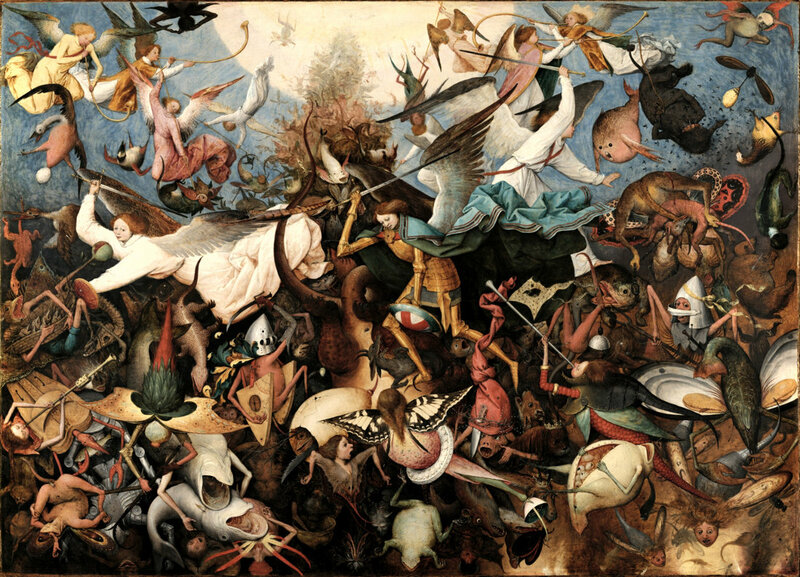 A plunge down is, however, the typical end product of combat, described in Bruegel’s spectacle, “The Fall of the Rebel Angels.” What saves this image from the triteness of its message– goodness defeating sinfulness—is the multi-elbowed structure of its layout—and something more, a reversal of standard, moralizing, tone. An effeminate, armored St. Michael, with companion angels, slashes through a putrid slew of reptiles, fish maws, anuses, goblins and bugs. These are the mongrel rebels, ex- angels rancid with associated textures. As they sink down, ejected from paradise, those creatures in the lower, abysmal zones shriek with terror at the imminence of their death and disappearance. Still, their vivacity compares favorably with the unconcerned ruthlessness of the executioners above them, who are depicted as prettified killing machines. Bruegel’s sympathy for the devil traces back over forty-five years earlier to Bosch, a mystic, decorative and more pessimistic artist. For both of them, myths and diableries occur quite evidently in a mental space that has no physical existence. In fact, the creator of “The Fall of the Rebel Angels” had swept a village square at least partly into his imaginative region, three years earlier. I refer to the painting known as “Flemish Proverbs.” Single figures perform inexplicable, harebrained or disconnected acts, unnoticed by their immediate neighbors. Regardless of the festive atmosphere and their dense population, they do not form a community. But contemporary viewers would have known how to decode such arcane behaviors, pantomimed in Bruegel’s illustrations of about a hundred popular sayings. The eye goes from one to another of them in a random distribution of meanings, none isolated or built up for dramatic climax. As a whole, “Flemish Proverbs” looks at first like straight genre, but actually works like a catalogue. Here, Bruegel comes close to sacrificing his open sense of worldly space to a composite of various textual controls. Either way, he needed to hold on to his downward shift of view, since its wide, oblique perspective accommodated his increasingly anthological instincts. Above all, (if you’ll excuse the pun), the downward glance operates as an illusion. It makes you think that Bruegel was up there, somewhere, 50 to 100 feet or more, in a state of privileged buoyancy. And from this perch, he could study the extent and scatter of doings that were observable but otherwise obstructed from sight of each other at ground level. To bring off the illusion of visual command, especially of peripheral areas, the downward survey had to be more than approximate or hypothetical. “Flemish Proverbs” oscillates between observational and literary paradigms without integrating them into a coherent scan. The illustrative concept of the work required that the background figures be too large in proportion to their far distant status. In order for his illusion to work, Bruegel had to solicit viewers into thinking that they shared his perspective, whether it be elevated or immersed in the proceedings. This art renders its chief theme, social life, as a gamut of people’s activities, impelled by abrupt, indefinite, miscellaneous, short-term aims that partly coalesce or diverge, on unpredictable schedules. Even rituals enacted for one unitary purpose may quiver with fractious or lapsed performances. Suppose I learn that someone important is giving a speech, of possible interest. But I arrive only after the oratory has begun, having missed an undetermined part of what was said. I am obliged to take a place at the back of the speaker’s crowd, composed of individuals whose attention varies from slack to intense. My timing, you might say, is bad. Yet this is the prospect given in Bruegel’s “St. 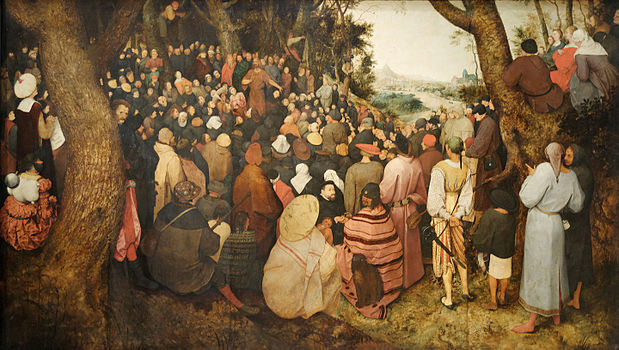 John the Baptist Preaching.” Jesus is there, but as a presence he hardly counts and John is too far away to be heard distinctly. If fortuitous circumstances impede our desires or goals in real time, they might imply the same in pictorial space. On behalf of principled loyalty to his theme, Bruegel declines to highlight the figureheads of the tale, while with its title he at least gives me a warrant to look for them. In the course of doing so, I forget the Savior’s baptism, and enjoy the captivating medley of bewildered or credulous faces–such human touches in a pious atmosphere. Happy are the spectators of Bruegel’s art, who find pleasures they weren’t looking for. These chancy and fresh impressions become all the more acute when compared with the optimal moments established in ceremonious art that preceded them. As soon as a spectator contacts one of those grand statements, endowed with a perpetual readiness for inspection of its dignity, magnitude and grace, it’s as if an appointment is kept. No such convergent or momentous meeting between viewer and work is conveyed in Bruegel’s art. He deals with stories of known outcome but deliberately minimizes it or scrambles narrative sequence. To be sure, the seasons of the year could be trusted to repeat their familiar cycle, as he invoked it in a well-known series of paintings. But I think it’s safe to say that when it came to much briefer activities—such as gestures and expressions—they had no seasons. People carried on quite spontaneously—and, of course irreverently—to the degree that they were ignorant of their status as characters represented in a prestigious story. Bruegel’s use of the frame powered this effect into something quite memorable. From its once neutral rectangular zone, he morphs the window-like aspect of the frame into a personal view, loaded with incidental content. He takes it where he wants, to work as a freely chosen gate of entry into a situation that is by its nature fluid and boundless. This point of view can never make evident the whole of the situation, but it grasps what it sees by implying its own physical limits. The resemblance between this approach and the way we perceive and understand the world is seductive. With Bruegel, a viewer begins to feel that he or she is there, has been transported through an invisible check- point into a living spectacle. How else to indicate the sense he gives to viewers of their voyeuristic intrusion into public events? It turns out that most of the personnel who compose those events are up to nothing significant or anything decorous; they’re just off guard, relaxed, and they don’t “see” the artist, a sharp-eyed visitor who figuratively wanders among them or floats above them. He is the poet of the un-self conscious; the discoverer of the inopportune. Bruegel’s peasant scenes sometimes exemplify this vantage very well. They have been admired quite justly for their intimate description of manners and customs, taken for granted in local communities. But I am more interested in how some people inadvertently get in the way of a clear sighting of other people– from Bruegel’s point of view. In “The Wedding Feast”, he seems to be located in front of two passing men, stopped by a diner who removes bowls of porridge they carry on an old door, to distribute to people at the table. Between his left arm and his right, which stretches inward below the bride, one sees part of a cutting board, a knife, a saltshaker; and above his sleeve, her folded hands. This prosaic inventory of things seen does little to account for the agency of the artist’s glance, transfigured in paint. For intervals, shapes, and the presence of objects are about to be sidestepped even as they are revealed, in only a fugitive instant. The ephemerality of the sighting is further declared along the faces at the dinner table, this time with a psychology as fleeting as the action of limbs or the pouring of jugs. The artist leads me to believe that with his next blink, the faces would of course remain, but not the same, mixed expressions. As for a common mood, no one can say. 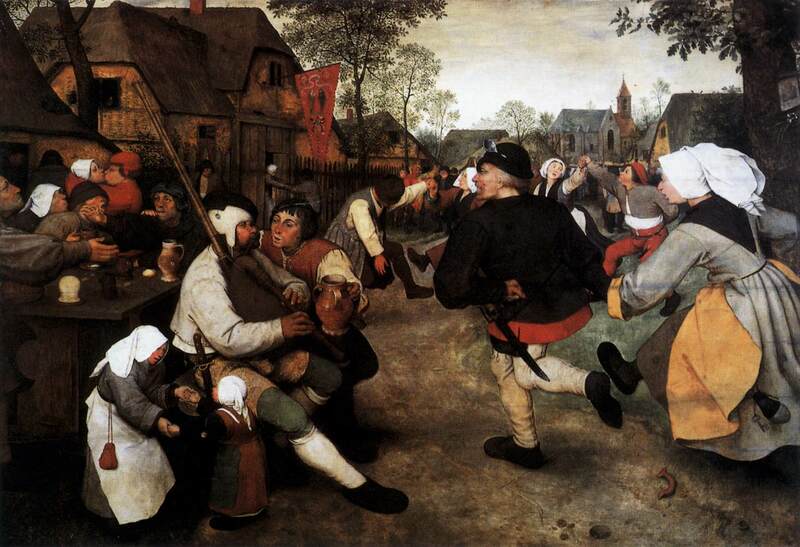 Bruegel’s artistic form was actually ill suited to the portrayal of things in transition. He was a masterly draftsman, particularly skilled in facial and figural description. His linearity and stippled textures give great credit to boundary, surface, and weight. Finally, he does not hold back on color, which is pungent and local. Bruegel employed all the versatility of his craft to imbue appearances with substance, an effect contrary to their shimmer when the perceiving eye is in actual motion. But when he brings substantial features to the peripheries of his tableaux—a problem arises that illuminates the insight of his compositions. Consider “The Peasants’ Dance” ca. 1568, where a man’s thrusting arm is amputated at the left margin. Icarus’s legs were still in the air, but this character’s body (though maybe not his head) is cut off from the picture. Viewers with a practical mind should dismiss any ridiculous idea that Breugel ran out of space—and necessarily had to truncate this figure. I think, rather, that the artist intended to show that whatever it does contain, the frame of vision is a matter of choice, necessarily restricted in it indications of time and place. It must therefore remain insufficient when it comes to revelation of story. Except on a visionary level, the two conditions, frame and narrative, resist being satisfactorily calibrated with each other. That is too much to ask of a painter who assumed that events were naturally infiltrated by distractions, which had their own content. Only twenty–five years before this work was painted, Copernicus had revealed that the earth revolved around the sun, not the reverse. From his elevated perspectives, imaginary or not, Bruegel could have gathered that the cosmos is grand and humankind is tiny–that absence plays a role in our consciousness as palpable as presence—the presence of our fellow beings. In “The Peasants’ Dance”, the thrust of the arm is surrounded by arguing figures, which makes for a combustible ensemble. But what is that to compare with the explosion of understanding that human companionship has its own pathos? In Bruegel’s case, a fondnesss for space congested with figures led him to a new order, a new clarity concerning where we are. Talk about a point of view! Max Kozloff has been painting since his college days, about 60 years ago, but is known as an art critic and street photographer. HIs latest book is “Vermeer A Study” Contrasto, 2011. Great to think about Bruegel again, and with such an insightful guide. Wonderful to look at Breughal again through your eyes! Bosch and Breughal are 2 of my favorites. And your painting is lovely!! !